Should I Repair or Replace My Air Conditioner or Heater? When you’re faced with the choice between replacing or repairing part or all of your heating and cooling system, you can count on us to help you find a solution that’s affordable, keeps your family comfortable and makes long-term sense. The heating efficiency of a furnace is measured by its Annual Fuel Utilization Efficiency (AFUE), which calculates the percentage of energy actually used to heat your home. Newer furnaces have an AFUE of 80% or more, and Comfort Solutions Heating and Air offers models up to 98.3%. If your current system has an AFUE of less than 80%, you could save considerably on your monthly utilities with an upgrade. For an air conditioner or heat pump, the measurement is Seasonal Energy Efficiency Ratio (SEER) – a higher SEER rating means greater energy savings. 14 SEER is the minimum currently required for most markets (13 SEER for air conditioners in some Northern markets), and Bryant has models up to 20.5. Upgrading to a higher SEER rating means energy savings over the life of the system. For heat pumps in heating mode, look for a Heating Seasonal Performance Factor (HSPF) of over 10 for greater efficiencies. We offer heat pumps with HSPF of up to 13. 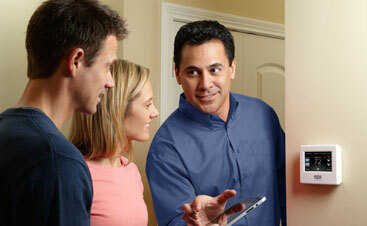 Installing a more efficient system may also qualify you for tax credits or local utility rebates. Talk to your us for more information about rebates and incentives available. We can offer a simple, 30-minute analysis of the air in your home to discover any indoor air quality issues. The analysis will provide several different options that fit your specific needs to improve the air in your home along with a break down of our products to treat any potential problems. When you understand the indoor air quality implications of your heating and cooling system, you can replace or upgrade your system in ways that help you breathe a little easier. If you decide to repair instead of replace, be sure to check out our Maintenance Agreements page to see how you can extend the life of your unit or even add an extended warranty for labor and parts to prevent future unexpected cost. 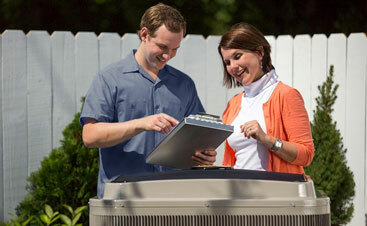 Whether you decide to repair or replace, you can trust in the quality of Comfort Solutions Heating and Air. Your heating and cooling system is one of the most expensive components of your home, and one of the most important – your family’s comfort depends on it. So the choice between replacing and repairing the system is a big one…and sometimes, if your furnace goes out in the dead of winter, or your air conditioning fails in the heat of August, the pressure to make the right decision is even more immediate. Know you have a reliable partner on your side. We will walk you through the pros and cons of either option, and we are committed to doing helps educate you enough to deliver the right solution for you and your family.